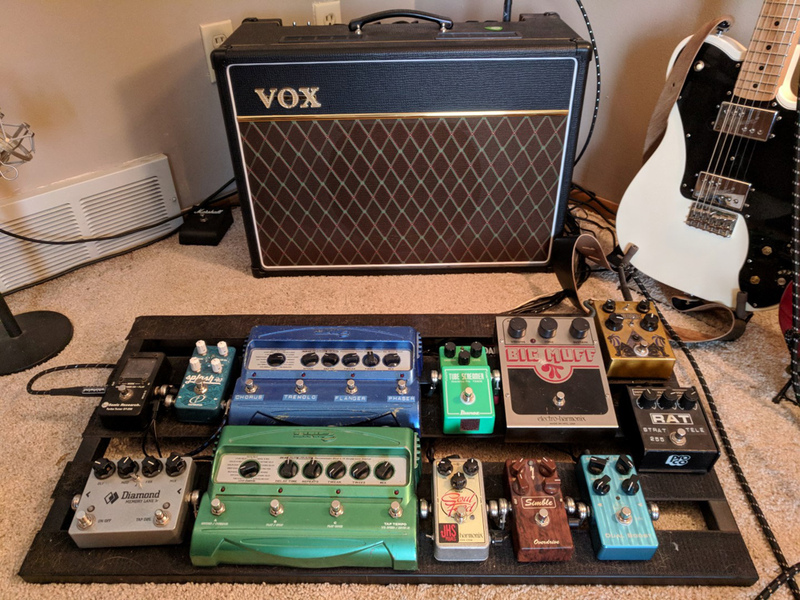 Today’s Pedal Line Friday submission is from Noah Saydel. If you have a pedal line (doesn’t have to be in a board) for your rig, please email me a photo, bio, description of pedals and routing to pedalline@nulleffectsbay.com. Every Friday I’ll showcase a pedal line submission. Make sure you include any links to your band or music page. Greetings from sunny and warm Wisconsin. After looking at everyone else’s boards every week I thought I’d send in mine. I’m the manager at Distinctive Guitar (distinctiveguitar.com) in Milwaukee so I’ve got an odd mix of road worn boxes from my high school/college playing days and newer, nicer stuff I’ve slowly acquired over the years I’ve been running the shop. Anyways, here’s the rundown in the order of signal flow. Cables are from Evidence Audio and run into a Vox AC-15. The pedals are powered by a mix of wall warts, and a Voodoo Labs Iso 5. My fuzz/distortion/overdrive section is getting a bit out of hand but who really cares. I use the Pharaoh as my main fuzz because it has so much range and control, I use the Big Muff just enough to keep it on the board. Same with my Rat, maybe it’s nostalgia but I can’t see pulling either of those pedals off. My Tube Screamer is my main overdrive. The Analog Man Silver Mod really takes that pedal the next level as far as fullness goes and the tone curve is much smoother. This Simble offers a Dumble style tone while the JHS Mod Soul Food covers the Klon side of things. Normally I don’t go after clones but I really like what both these pedals offer. I also run the Suhr Dual Boost in front of my overdrive pedals so I can hit them with a little or a lot more signal and fatten things up. The Line 6 pedals are probably the oldest on my board. I don’t use modulation much so the MM4 offers every flavor of modulation when I need it and the DL4 does the same for different delays. Despite all the hate the switches get in these I haven’t had any issues in the 10+ years I’ve had them *(knocks on wood)*. Unfortunately the volume drop on these old ones can be rough. The Memory Lane Jr. is a killer delay. Simple controls, super transparent, and a really lush analog sound, I’ve used a lot of delays but this is definitely my favorite. The same goes for reverb and the Splash MKIII. And you can even find a few of these pedals available at distinctiveguitar.com, Haha, it’s worth a try, right?